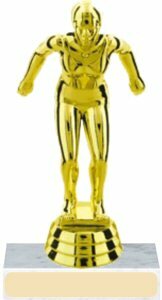 The industry standard for economical participation awards, basic trophy figure on a base. Customize your trophy by choosing your base and figure. Gold tone personalize plate makes this award real special! * Standard figure is 5" actual height may vary on the figurine you choose.